On May 19, 1992, the governor signed AB 152 (Katz) into law. This act merged the Los Angeles County Transportation Commission and the Southern California Rapid Transit District and created Metro (Metro). The CAC Executive Committee typically the first Friday of every month. The CAC General Assembly typically meets the Wednesday before the Board meeting of every month. (Please check the “Meeting Dates” link above for the CAC’s confirmed meeting dates, as approved by the CAC. The dates listed reflect any necessary adjustments that needed to be made by the CAC as a result of scheduling conflicts related to holiday schedules, etc). For questions on the CAC please call 213.922.1249. 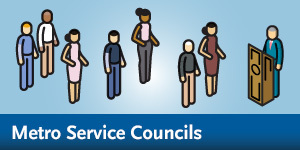 *CAC membership is on a voluntary basis and members do not receive stipends or compensation for serving on the council.